Many tattoos are inspired by nature and natural themes. Flowers, insects and animals are all common types of tats seen on both men and women. 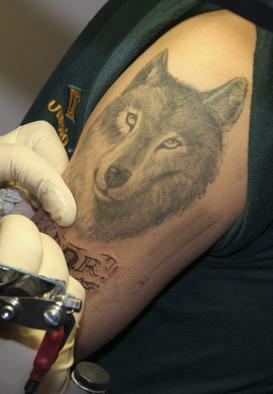 Some animal tattoos that are particularly popular are wolf tattoos. Wolf tattoos, like other Tattoo Designs, are usually worn for a reason. The owner of the tattoo may enjoy the look of a fierce wolf, or identify in some way with the mystical properties assigned to wolves. Many Native Americans choose to get wolf tattoos because wolves are extremely important in their mythology. Wolves are seen as teachers or pathfinders, and can also symbolize ancestors or other spiritual guides. Different types of wolves were indicative of different clans and Native American tribes, as well as commonly being used as totems. In astronomy and astrology, the wolf is represented in the stars by the constellation known as the Dog, or Sirius, in the Pleaides. This was also thought to be the origin of the "Ancients" by several of the Native American tribes. Some Celtic mythology depicts the sun being devoured by a wolf (the cause of night). In Norse mythology, the wolf is a sacred image to the god Odin, who was the father of all the other gods. Romans also revered the wolf, because this creature was sacred to the god Apollo, as well as being featured in the myth of Romulus and Remus. As with any tattoo, you have the option of designing your own wolf tat or choosing a wolf tattoo from flash designs. Since many people choose to get a wolf inked on their body for spiritual or cultural reasons, designing your own version may work best. Your tattoo artist will be happy to sit down with you and draw a custom tat - but it's often a good idea to bring pictures of what you want your wolf to look like. Tattoos of animals can be done in several different styles - from a stylized line drawing to a realistic "portrait" of a wolf copied from a photograph. Depending on the style of your wolf, you can also choose whether you want to have the tat colored, or prefer the simpler look of black and grey. Where you have your wolf tattoo placed on your body is a matter of personal preference, but many seem to think that the back or upper arm are good areas for this sort of work. Wolf tats can be quite detailed, and this level of tattoo precision can take several sessions to complete. Both men and women enjoy getting tattoos of wolves, because of their beauty, mystique and spiritual significance, and this style of tattoo transcends cultures and age groups.